Across the industry, whether analysts, magazines or on social media, most seem to agree that the stage has been set for the IT/OT convergence, the merging of Operations Technology and Information Technology best practices into a united operations management technology strategy that stretches from Edge to Enterprise. 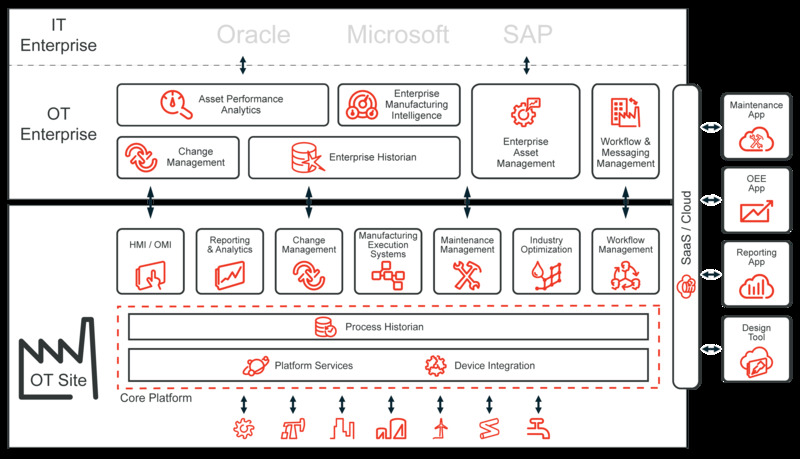 Various factors such as mobile devices, cloud acceptance, intelligent assets and the Industrial Internet of Things awareness have come together to create the optimal environment for industrial and manufacturing businesses to accelerate their technology adoption, enabling them to meet new and evolving economic demands. As any technology provider does and should do, we change with the market to better ourselves and our offerings to our customers. Industrial Software Solutions, also known as Wonderware PacWest, is proud to announce our expanded Enterprise Operations Management portfolio of products focused on enhancing our customer’s operations technology. The addition of the AVEVA Asset Performance product line adds maintenance and asset management capabilities to our comprehensive Monitoring & Control, and Operations & Optimization solutions. This unique software offering creates a purpose-built operations management foundation that can extend across the business. As our customers implement more advanced technologies to deliver the actionable intelligence they need to navigate current market trends, our software solutions will adapt and grow to meet their needs, from Edge to Enterprise.